Survivor is a forum and diary based roleplaying game held on Creatures Caves, played with 16 people. Creatures Caves members can place one vote in the Survivor poll each day, and the two players who have the most votes each Friday have to leave the Island (up until the last week). Rascii: "The first one took place on Geocities and was crappy"
The first "official" game of Survivor started on 16 June 2003. 16 players were selected, and the good ones posted in their journals every day of the happenings on the island. Gryph was declared the winner on 5 September, gaining a Tiki Norn norndoll made by Data. Don came second, by two votes. This game started on 8 September 2003 but was never really finished. It is described in Beth's Message in a Bottle column. 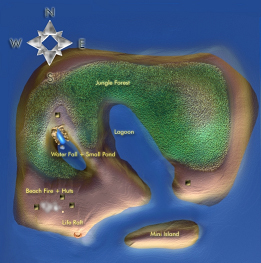 Survivor Island Map by GreenReaper. The third game of Survivor was scheduled to start on 20 May 2005, but the ship's engine broke and so it actually started on the 21st. Gryph was running the opinion column for this one. The game ran for three weeks before suffering some serious downtime mid-June and then again from mid-July onwards, causing several players to leave the Island early. The game ran for 43 days in total but after three months offline it was considered closed. The last six players on the Island were Officer 1BDI, Karias, Evilmoo, Laura, GreenReaper and ColonelJ. A forth game was planned for the CCSF 2006, but never eventuated. The 2008 survivor game was for 12 participants, and registration commenced on 12 noon EST on the first of July, 2008. Karias was to be the Survivor commentator, but Survivor 2008 was eventually cancelled because Rascii was too busy. The next Survivor game began on 12 August 2012, with Ghosthande as the Message in the Bottle writer. In contrast to previous Survivor games, each member of Creatures Caves only had one vote on each poll to remove two Survivors, not one vote per day, as in previous Survivor games. Weekly contests included making Survivor avatars, discovering a new animal, discovering an animal-eating plant, being poisoned by berries, and being attacked by a shark while fighting a typhoon. Due to ties in voting, on a couple of weeks, only one contestant was removed from the island. Jessica was the eventual winner, and won a Coconut Dolly agent from Ghosthande. Ghosthande also made a Survivor Radio agent for everyone to enjoy. Registrations for Survivor 5, dubbed "Survivor: Arctic", opened on the 6th of December 2012. Grendel Man was announced as the Message in the Bottle writer. Survivor opened on 30 December, 2012, with one vote per day rather than one vote per week. Weekly contests included drawing a map of the island, catching a polar bear cub, surviving an avalanche, and Survivor Iceberg melting into the ocean. Mea was the eventual winner, and won an Ice Cream Machine, made by Ghosthande. Registrations for Survivor 6, dubbed "Survivor: Space", opened on the 1st of August 2013. Players could choose their avatar freely, and had the choice of an item to bring and a weapon. This page was last modified on 31 May 2016, at 20:17.